The potential role of A1 adenosine receptors in modulating neuromuscular transmission in the detrusor muscle of the urinary bladder has been tested in human and murine preparations with the intent to determine the viability of using adenosine receptor agonists as adjuncts to treat overactive bladder. In human detrusor muscle preparations, contractile responses to electrical field stimulation were inhibited by the selective A1 adenosine receptor agonists 2-chloro-N6-cyclopentyladenosine, N6-cyclopentyladenosine (CPA), and adenosine (rank order of potency: 2-chloro-N6-cyclopentyladenosine > CPA > adenosine). Pretreatment with 8-cyclopentyl-3-[3-[[4(fluorosulphonyl)benzoyl]oxy]propyl]-1-propylxanthine, an irreversible A1 antagonist, blocked the effects of CPA, thus confirming the role of A1 receptors in human detrusor preparations. In murine detrusor muscle preparations, contractions evoked by electrical field stimulation were reduced by CPA or adenosine. 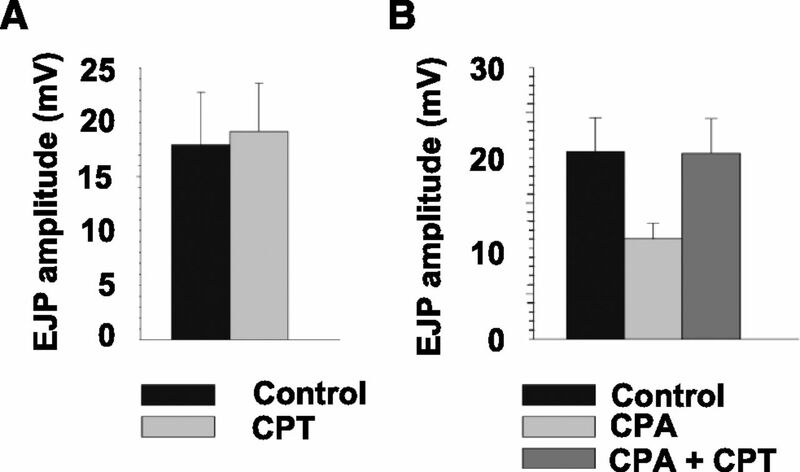 Amplitudes of the P2X purinoceptor–mediated excitatory junctional potentials (EJPs) recorded with intracellular microelectrodes were reduced in amplitude by CPA and adenosine with no effect on the spontaneous EJP amplitudes, confirming the prejunctional action of these agents. 8-Cyclopentyltheophylline, a selective A1 receptor antagonist, reversed the effects of CPA on EJP amplitudes with no effect of spontaneous EJPs, confirming the role of A1 receptors in mediating these effects. Overactive bladder (OAB) is a urinary bladder voiding dysfunction composed of urinary urgency, usually accompanied by frequency and nocturia, with or without urgency urinary incontinence, that affects 8.0%–25.8% of the population (Irwin et al., 2011; An et al., 2014). Normal function of the urinary bladder is dependent on the coordinated control of both the urinary bladder detrusor muscles and the sphincter muscles surrounding the bladder neck. Neuronal control of detrusor muscle contraction is exerted by parasympathetic cholinergic neurons (Thompson, 2004). Agents that block muscarinic receptors, which act by inhibiting neuromuscular transmission to the urinary bladder by blocking postjunctional muscarinic receptors in the detrusor muscle, are the first line of therapeutic agents prescribed for OAB treatment. However, up to 75% of patients treated with antimuscarinic drugs discontinue their use, either due to poor tolerance of their side effects or because of a lack of efficacy (Kelleher et al., 1997; Chapple, 2000; Chancellor et al., 2013). Botulinum toxin A (BotxA) was recently introduced as a treatment for OAB. It is thought that BotxA treatment inhibits neurotransmission by blocking acetylcholine (ACh) release from the cholinergic nerves innervating the detrusor muscle (Lawrence et al., 2010; also see Ikeda et al., 2012; Collins et al., 2013 for alternative mechanisms). BotxA treatment is an invasive procedure that may lead to infection, bleeding, or voiding impairment, including urinary retention that requires catheterization (Kuo et al., 2010). Hence, alternative mechanisms for inhibiting detrusor neurotransmission may have therapeutic potential for the treatment of OAB either in isolation or in combination with antimuscarinic agents or β3 agonists such as mirabegron (Myrbetriq; Astellas Pharma Inc., Northbrook, IL) (Yamaguchi et al., 2014). Promising potential targets for OAB therapy include the inhibitory purinergic receptors. Inhibitory effects of adenosine on neurotransmitter release were first demonstrated at the rat skeletal neuromuscular junction by Ginsborg and Hirst (1972). This and subsequent studies demonstrated that the inhibition of ACh release by adenosine at the skeletal neuromuscular junction is mediated via A1-type adenosine receptors (Redman and Silinsky, 1993; Correia-de-Sá et al., 1996: Silinsky, 2004). Evidence for A1 receptors affecting detrusor neurotransmission has been found in mouse bladder contraction studies (Acevedo et al., 1992) as well as in brief reports in human and guinea pig detrusor preparations (Ikeda et al., 2004). In normal, healthy subjects, human detrusor neurotransmission is mediated entirely through muscarinic receptors, whereas P2X purinoreceptors have been implicated in diseases of the human bladder (Ford and Cockayne, 2011). Because neurotransmission in the murine detrusor muscle is mediated by both P2X purinoreceptors and muscarinic receptors (Searl and Silinsky, 2012a), the mouse detrusor represents a valuable tool for the study of P2X receptors. In addition, the presence of a P2X-mediated component of neurotransmission (P2X receptors are ligand-gated cation channels) allows the use of electrophysiological recording (Hoyle and Burnstock, 1985; Fujii, 1988; Brading and Mostwin, 1989; Bramich and Brading, 1996; Searl and Silinsky; 2012a). Specifically, evoked responses measured as electrically evoked excitatory junctional potentials (EJPs) and spontaneous excitatory junctional potentials (sEJPs) can both be measured, thereby allowing quantal analysis of changes in neuromuscular transmission to be determined in murine detrusor preparations (Searl and Silinsky, 2012a). This electrophysiological approach has proven useful in the past to enhance our understanding of the cellular mechanisms underlying neuromuscular modulation (Silinsky, 2004) and can be used to facilitate the examination of the mechanisms regulating parasympathetic transmission in the mammalian bladder (Searl and Silinsky, 2012a). This study aimed to determine the role of A1 adenosine receptors in detrusor transmission in both human and murine muscle and to test the effects of A1 receptor activation on the quantal release of ATP in murine detrusor muscle using electrophysiological methods. Human studies were carried out in accordance with the Declaration of Helsinki. The ethics and study protocols were approved by the institutional review boards of Southern Illinois University Medical School and Northwestern University Feinberg School of Medicine. Bladder tissue obtained from consenting patients undergoing radical cystectomy by surgeons in the Southern Illinois University Division of Urology was immediately placed in a HEPES-buffered solution (pH 7.2). For the animal studies, the methods used for anesthesia and exsanguinations were in accordance with guidelines established by the National Research Council (2011) and the institutional animal welfare committees of Northwestern University and Southern Illinois University Medical School. Briefly, female mice (B6129F2J, weighing 20–30 g; Jackson Laboratory, Bar Harbor, ME) were anesthetized with 5% isoflurane for 3–5 minutes, until unresponsive to touch, followed by cervical dislocation and exsanguination. The urinary bladder was removed and placed in a balanced salt solution containing 137 mM NaCl, 5 mM KCl, 2 mM CaCl2, 2 mM MgCl2, 30 mM HEPES, 24 mM NaH2CO3, 1 mM NaH2PO4, and 11 mM dextrose (pH 7.2–7.4) and gassed with O2 in a Sylgard-lined chamber (silicone elastomer, volume of approximately 4 ml; Dow Corning Corporation, Midland, MI). The bladder was dissected along the ventral wall with a longitudinal incision from the bladder neck (posterior) to the top of the dome (anterior) and the bladder was opened and pinned flat (interior surface uppermost). Unless otherwise stated, the urothelium and suburothelium were removed with careful dissection. The detrusor tissues used in these experiments were donated by 4 female and 17 male patients. The human detrusor muscle was cut into strips (4–8 mm × 15–20 mm) and mounted using silk sutures in 10-ml tissue baths (World Precision Instruments, Sarasota, FL). Electric field stimulation (EFS) (0.05-millisecond square pulse duration; 5, 10, and 20 Hz, 5 and 120 seconds apart) was applied via Ag/AgCl electrodes and delivered from a Grass Instruments stimulator (S48 or S88) (Natus Neurology Inc., Warwick, RI) under the control of an Arduino microprocessor board (Arduino LLC, Cabridge, MA). For construction of the carbachol concentration-response curves, maximal contractile responses were obtained at the end of the experiments with application of 1 mM carbachol after washout of the adenosine receptor agonist. For the murine studies, the bladder detrusor muscle was bisected with two equal halves and mounted with silk sutures in 10-ml tissue baths. EFS (0.05-millisecond duration) was applied at 1, 5, and 10 Hz for 5 seconds, every 120 seconds via Ag/AgCl electrodes. Tension measurements were made with either Radnoti (Radnoti LLC, Monrovia, CA) or Grass FT 103 tension transducers (using a modified WPI transbridge transducer amplifier) with signals fed to Digidata 1440 and recorded via AxoScope software (Molecular Devices, Sunnyvale, CA). Hexamethonium (300 µM) was present in all contraction experiments to block ganglionic nicotinic receptors. For electrophysiological experiments, the detrusor muscle was pinned (outside surface uppermost) and muscle cuts were made along the craniocaudal axis to restrict muscle contractions. Silver wire electrodes were placed on the surface of the muscle sheet. The chamber was mounted on the heated stage (Dagan Corporation, Minneapolis, MN) of an inverted microscope (Nikon, Tokyo, Japan) and maintained at 36°C to 37°C by superfusion with warmed physiologic saline solution at a constant flow rate (12 ml/min−1). Electrophysiological experiments were performed in the presence of 10–15 µM nifedipine to block the postjunctional L-type Ca2+ channels, thereby revealing the underlying EJP. Atropine (100 nM) was also used to block contractions of the muscle mediated by muscarinic receptors and 300 µM hexamethonium used to block ganglionic nicotinic receptors. Electrically evoked responses were elicited using field stimulation of the preparation (0.5-millisecond duration at a frequency of 0.1 Hz), with the bath electrode strategically placed to minimize the stimulus artifact. Intracellular recordings were made from the smooth muscle cells with glass capillary microelectrodes, filled with 0.5 M KCl (tip resistance, 60–100 MΩ) using a high-input impedance amplifier (Axoclamp-2A; Molecular Devices, Sunnyvale, CA). Signals were filtered (5 kHz low-pass), amplified, and digitized at 1 kHz using a Digidata 1200 A/D converter (Molecular Devices, Sunnyvale, CAs) and sent directly to a computer using winEDR software. The data were analyzed using winEDR and winWCP programs (J. Dempster, Strathclyde University, Glasgow, UK) as well as Microsoft Excel (Microsoft Corporation, Redmond, WA), Corel Quattro Pro (Corel Corporation, Ottawa, Canada), Sigma Plot, and Sigma Stat software packages (SPSS Inc., Chicago, IL). Sigma Plot was used to provide sigmoidal curve fits of individual and averaged data. Carbamylcholine chloride (carbachol), 2-chloro-N6-cyclopentyladenosine (CCPA), N6-cyclopentyladenosine (CPA), and 8-cyclopentyltheophylline (CPT) were obtained from Sigma-Aldrich (St. Louis, MI). 8-Cyclopentyl-3-[3-[[4(fluorosulphonyl)benzoyl]oxy]propyl]-1-propylxanthine (FSCPX) was obtained from Santa Cruz Biotechnology (Santa Cruz, CA). In the experiments with FSCPX, we followed the protocol previously used by Gesztelyi et al. (2013) to block A1 receptor activation in isolated guinea pig atria. Briefly, preparations were pretreated with 10 µM FSCPX for an hour and then subsequently washed with drug-free solution for 45 minutes before testing the effects of CPA. All other chemicals were obtained from VWR International (Radnor, PA). Comparisons were made by either parametric statistics (paired t test) or nonparametric statistics (Mann–Whitney rank-sum test; see Glantz, 1992). For multiple comparisons, either analysis of variance (ANOVA) or Bonferroni corrections were used. For the purpose of discussion of the results, differences between groups were considered significant when P < 0.05. For all experiments, n represents the number of single experiments carried out from a single patient or animal. For electrophysiological experiments, single intracellular impalements on individual preparations were used. In contraction studies when multiple bladder strips from a single patient or animal were tested, results were averaged and the averaged result was treated as a single n value. Data are presented as means ± 1 S.E.M. Adenosine Inhibits Human Detrusor Muscle Contractions. The first series of experiments were made on the effects of A1 adenosine receptor agonists on human detrusor muscle. Fig. 1 shows the concentration-dependent inhibition of evoked human detrusor muscle contractions by the endogenous nonselective adenosine receptor agonist adenosine and by two selective A1 adenosine receptor agonists (CCPA and CPA). Fig. 1A shows the log concentration-response curves for the inhibition of contractions expressed as a percentage of maximal inhibition for each individual experiment. As shown in Fig. 1, the rank order of potency of adenosine agonists on the inhibition of EFS-mediated contractions (CCPA > CPA > adenosine) is consistent with the activation of A1 receptors (EC50 values: CCPA, 1.42 ± 0.679 µM, n = 6; CPA, 10.8 ± 3.53 µM, n = 5; and adenosine, 145 ± 33.7 µM, n = 8; ANOVA, P < 0.001) (Gao and Jacobson, 2002; Fredholm et al., 2011). Adenosine (200 µM, n = 5), CCPA (10 µM, n = 5), and CPA (12.5 µM, n = 5) did not have any significant effect on detrusor contractions in response to carbachol application (Fig. 1B), indicating a lack of postjunctional effects of these adenosine receptor agonists at these concentrations. Adenosine Inhibits Muscarinic and Purinergic Transmission in the Murine Detrusor Muscle. To further our understanding of the effects of A1 adenosine receptors on detrusor transmission, the effects of adenosine receptor agonists were tested in murine tissue, in which the contribution of P2X receptors toward detrusor transmission allows for changes in neurotransmission to be measured with electrophysiological techniques. The effects of adenosine and CPA were initially tested on murine detrusor contractions to determine whether the effects of these agents are similar in human and murine tissues. As demonstrated in the concentration-response curves in Fig. 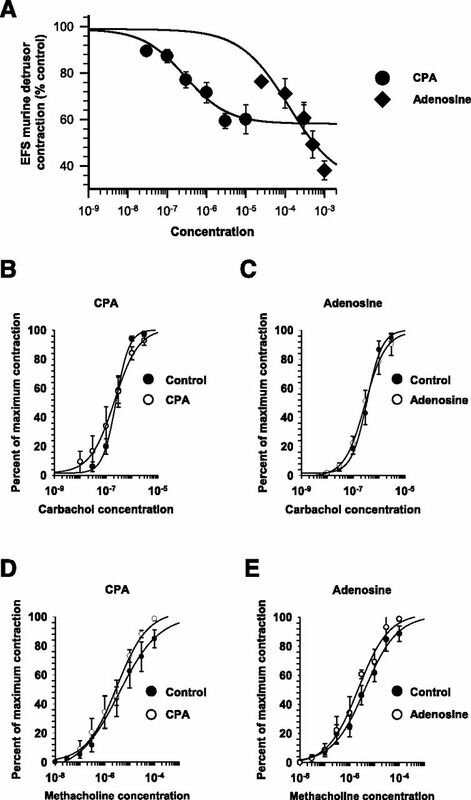 3A, inhibition of murine detrusor muscle EFS-evoked contractions by CPA (EC50 175 ± 60 nM; n = 5) and adenosine (EC50 97.5 ± 8.5 µM; n = 5) are consistent with actions on A1 adenosine receptors. However, the maximal inhibition of EFS-evoked contractions was significantly greater with adenosine versus CPA (P = 0.021), suggesting that at the higher concentrations of adenosine used, additional adenosine receptors may play an inhibitory role, including A2B-type adenosine receptors (Fredholm et al., 2011; Weller et al., 2015). In contrast with the human detrusor muscle, neurotransmission to murine detrusor muscle consists of both cholinergic and purinergic components (Searl and Silinsky, 2012a). Indeed, contractions in response to EFS (10 Hz, 5 seconds duration) were reduced to 63% ± 8% of the control after application of atropine (n = 8), confirming that a substantial portion of the contractile response in the murine bladder is mediated by purinergic receptors. Because concentration-contraction response curves evoked by carbachol or the selective muscarinic agonist methacholine were not affected by either adenosine (500 µM) (Fig. 3, C and E) or the A1 adenosine receptor agonist CPA (3 µM) (Fig. 3, B and D), it appears that these adenosine agonists are working exclusively on prejunctional loci. This contrasts with the postjunctional effects of A1 receptor activation seen in the human colon (Fornai et al., 2009). 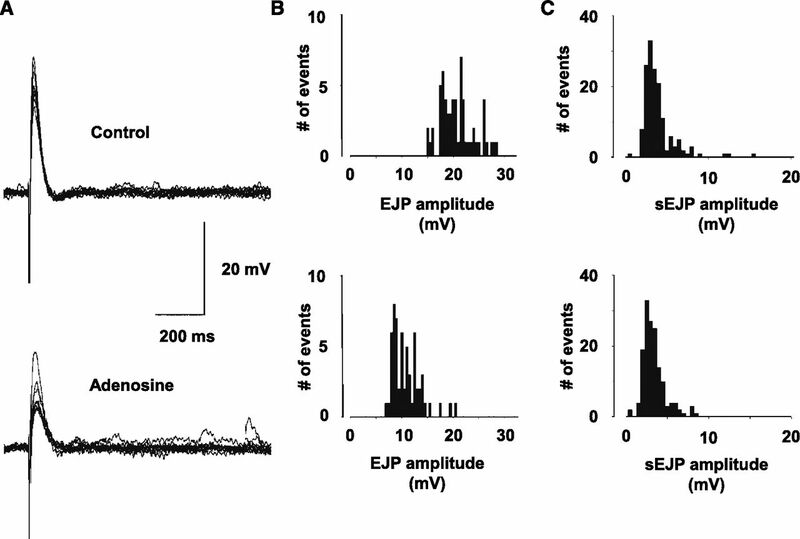 The purinergic component of neurotransmission in the murine detrusor provides a means to measure both the purinergic component of neurotransmission and changes in postjunctional sensitivity to ATP by exploiting the electrically evoked EJP and spontaneous sEJP amplitudes (Searl and Silinsky, 2012a). As shown in Figs. 4 and 5, neither adenosine nor CPA had any effect on sEJP amplitudes, demonstrating that the inhibitory effects of these A1 adenosine receptor agonists were exclusively prejunctional. For the adenosine experiments, sEJP amplitudes were 6.1 ± 1.3 mV in the control versus 7.1 ± 1.8 mV in 1 mM adenosine (n = 7). For the CPA experiments, sEJP amplitudes were 3.4 ± 1.5 mV in the control versus 4.0 ± 1.6 mV in 3 µM CPA (n = 5). In contrast with the spontaneous events, the EJPs were reduced in amplitude by CPA (EC50 179 ± 44 nM; n = 5) and adenosine (EC50 161.4 ± 31.6 µM; n = 7), indicating a presynaptic inhibitory effect of A1 receptor activation on evoked ATP release. Examples from typical experiments of EJPs before and after the addition of adenosine are shown in Fig. 5, as is a typical example of the effects of adenosine on EJP and sEJP amplitude distributions. The effects of CPA and adenosine on EJP amplitudes. (A) Concentration-response curves for the inhibition of EFS-evoked EJP amplitudes. 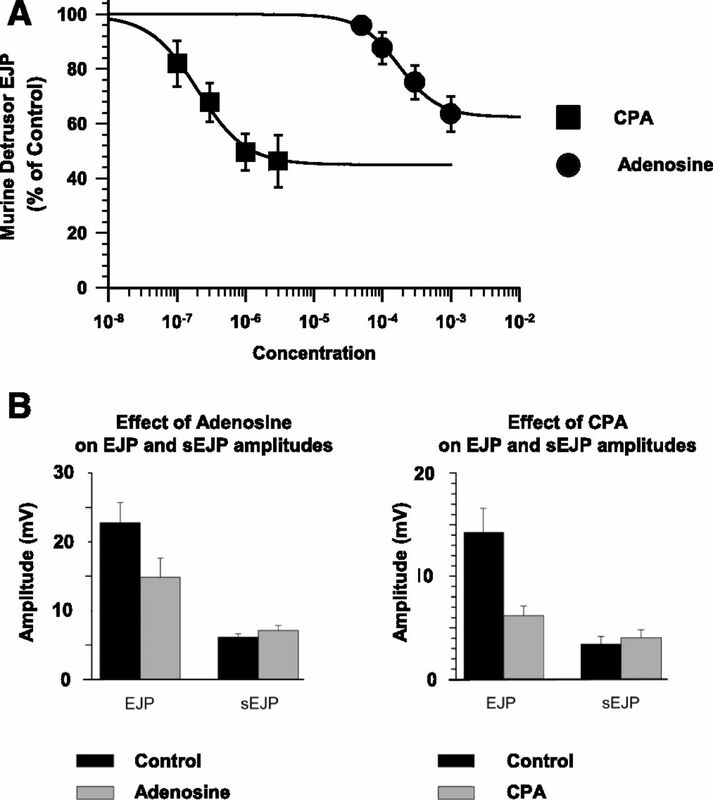 The potencies of adenosine (n = 7) and CPA (n = 5) on the EFS-evoked contractions (Fig. 3) and on EFS-evoked EJPs were similar, such that the EC50 concentrations of adenosine and CPA for contractions and EJP were not significantly different (P = 0.126 and P = 0.076, respectively). (B) The inhibitory effects of adenosine (1 mM) and CPA (3 µM) on EJP amplitudes and the lack of effect of these agents on sEJP amplitudes. Influence of Urothelium-Derived Adenosine on Detrusor Neurotransmission. It is known that substantial amounts of ATP are released from the urothelium (the inner wall of the urinary bladder) lining the bladder (Ferguson et al., 1997). This ATP release is implicated as playing a major role in the sensory arm of the urinary bladder via sensory nerve activation (Vlaskovska et al., 2001). Thus, it might be possible for adenosine derived from this urothelium ATP release to affect detrusor transmission. However, as shown in Fig. 7, the inhibitory effects of 3 µM CPA were not significantly different between intact urothelium-detrusor preparations and those preparations in which the detrusor was denuded of the urothelium and suburothelium tissues. The purpose of this study was to determine the potential for adenosine agonists to serve as therapeutic adjuncts in modulating neuromuscular transmission in the detrusor muscle of the human and murine urinary bladder. The relative potencies of A1 adenosine receptor agonists on human detrusor muscle contractions are consistent with actions on A1 adenosine receptors (CCPA > CPA > adenosine). 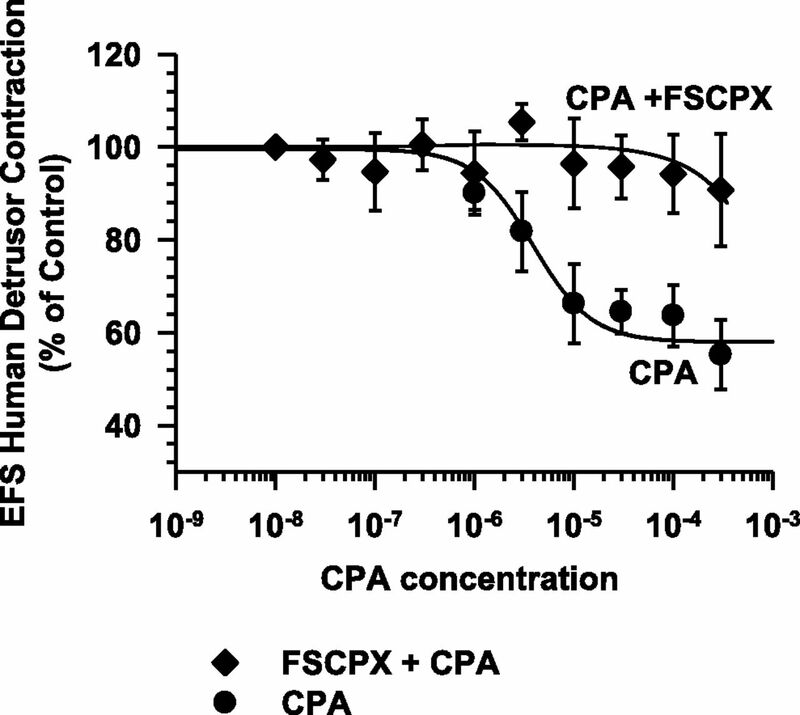 Incubation with 10 µM FSCPX abolished the effects of CPA and reduced the effects of adenosine, further supporting the role of A1 receptors underlying the inhibitory actions of CPA and adenosine. 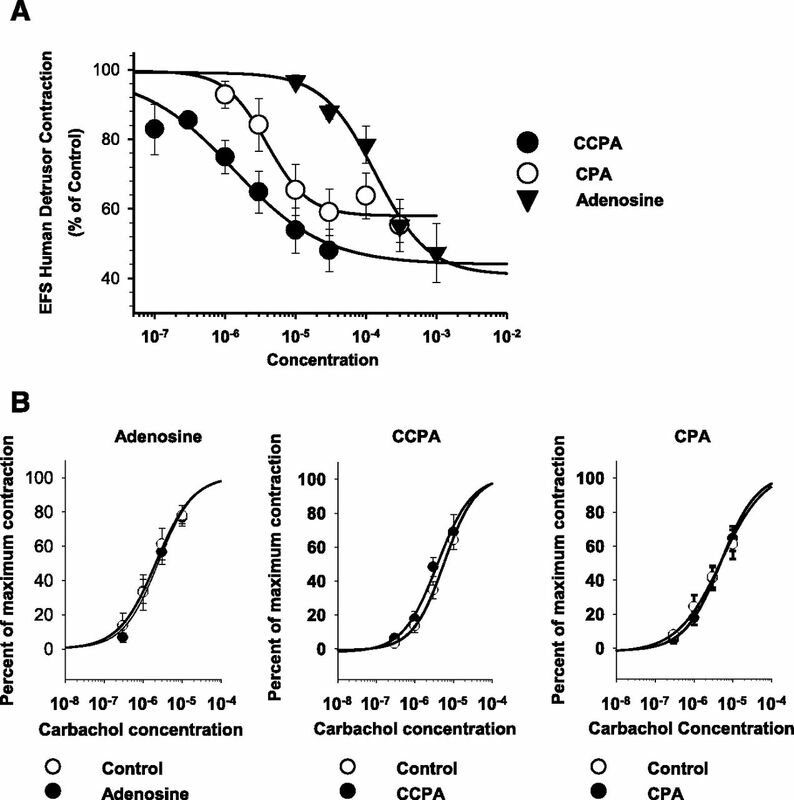 Application of concentrations of CCPA, CPA, or adenosine at greater than EC50 concentrations resulted in no change in responses to ACh, methacholine, or carbachol, suggesting that the effects of A1 receptor agonists are prejunctional and that postjunctional effects are not seen at these concentrations of A1 adenosine receptor agonists. It is worth noting that the dose-response curves for CPA resulted in a lower maximal inhibition than either CCPA or adenosine. This may be related to a greater selectivity of CPA on A1 receptors compared with the known actions of adenosine on A2-type adenosine receptors, which are also present on the detrusor muscle. Because CCPA and adenosine had similar effects on the contractions evoked by EFS in both human and murine detrusor muscle, we thus used electrophysiological methods on the murine detrusor preparation to test for prejunctional changes in transmitter release by adenosine and CPA on evoked purinergic EJP amplitudes and sEJPs. Our results showed that evoked EJPs were reduced but sEJP amplitudes were unaffected by these agents, indicating a prejunctional effect on the nerve endings innervating the detrusor muscle (i.e., adenosine and CPA act to reduce the number of quanta evoked by nerve stimulation). In addition, the A1 adenosine receptor antagonist CPT reversed the effects of CPA, further supporting the role of A1 adenosine receptors underlying these effects. The potencies of adenosine and the A1 receptor agonists are similar to those seen at the rodent skeletal neuromuscular junction (Nagano et al., 1992; Correia-de-Sá et al., 1996; Silinsky, 2004). It should be mentioned that one feature of adenosine receptors is that the efficacy of adenosine and adenosine agonists vary many fold between tissues, depending on the numbers of spare receptors present (Fredholm, 2010; Gesztelyi, et al., 2013). The low potencies of adenosine and the A1 adenosine receptors agonists at the murine and human detrusor muscles suggest that the spare receptor populations in both preparations are comparatively low (Fredholm, 2010; Gesztelyi et al., 2013; Kiss et al., 2013). In addition, the EC50 concentrations for EJPs and for contractions were not significantly different in this preparation (Figs. 3 and 4), suggesting that contraction studies may provide a reliable measure of the potency of prejunctionally acting drugs in detrusor muscle preparations. The urothelium and the underlying suburothelium are generally believed to play an important role in regulating detrusor muscle activity and also play an inhibitory role in neurotransmission (Chaiyaprasithi et al., 2003; Munoz et al., 2010). In our contraction experiments, the effects of CPA were unaffected by the presence of the urothelium, with no significant differences between the effects of CPA on EFS-evoked contractions in preparations with the detrusor alone and those in which the urothelium was left intact, suggesting that there was insufficient endogenous adenosine present to affect detrusor transmission in these experiments. The potential clinical benefits of A1 adenosine receptor agonists as therapeutic treatment of OAB in unclear. Thus, in one study, intravesical perfusion of subnanomolar concentrations of CCPA was found to significantly lower the voiding threshold in both control and cyclophosphamide-treated rats (Prakasam et al., 2012). However, in a different study also in rats, intravesical perfusion of CCPA was found to reduce bladder overactivity induced by dimethylsulfoxide (Kitta et al., 2014). In summary, both the contraction and electrophysiological evidence presented here demonstrate that activation of prejunctional A1 adenosine receptors provides a potential means to dampen aberrant transmission to the detrusor muscle from nerves innervating both human and murine detrusor muscle. Potentially, targeting such agents to the urinary bladder to minimize potential harmful effects on cardiac function might be attained through the synthesis of prodrugs. However, further in vivo studies are needed to test for the potential usefulness of A1 adenosine receptor agonists, acting either alone or as adjuncts acting synergistically with antimuscarinic agents or β3 receptor agonists for the treatment of OAB. The authors thank Svetlana Gershburg for technical assistance with experiments on human detrusor muscle preparations. Participated in research design: Searl, Dynda, Alanee, El-Zawahry, McVary, Silinsky. Conducted experiments: Searl, Dynda, Alanee, El-Zawahry, McVary. Wrote or contributed to the writing of the manuscript: Searl, Dynda, Alanee, El-Zawahry, McVary, Silinsky. This research was supported by the National Institutes of Health National Institute of Diabetes and Digestive and Kidney Diseases [Grant 1R01DK095775], Northwestern University Feinberg School of Medicine, and the Southern Illinois University Urology Endowment Fund. (1992) Pharmacological characterization of adenosine A1 and A2 receptors in the bladder: evidence for a modulatory adenosine tone regulating non-adrenergic non-cholinergic neurotransmission. Br J Pharmacol 107:120–126. (2014) OAB epidemiological survey of general gynaecology outpatients and its effects on patient quality of life. Neurourol Urodyn DOI: 10.1002/nau.22659 [published ahead of print]. (1989) Electrical and mechanical responses of guinea-pig bladder muscle to nerve stimulation. Br J Pharmacol 98:1083–1090. (1996) Electrical properties of smooth muscle in the guinea-pig urinary bladder. J Physiol 492:185–198. (2003) Inhibition of human detrusor contraction by a urothelium derived factor. J Urol 170:1897–1900. (2013) Long-term patterns of use and treatment failure with anticholinergic agents for overactive bladder. Clin Ther 35:1744–1751. (2000) Muscarinic receptor antagonists in the treatment of overactive bladder. Urology 55 (Suppl):33–46, discussion 50. (2013) OnabotulinumtoxinA significantly attenuates bladder afferent nerve firing and inhibits ATP release from the urothelium. BJU Int 112:1018–1026. (1996) Presynaptic A1 inhibitory/A2A facilitatory adenosine receptor activation balance depends on motor nerve stimulation paradigm at the rat hemidiaphragm. J Neurophysiol 76:3910–3919. (1997) ATP is released from rabbit urinary bladder epithelial cells by hydrostatic pressure changes--a possible sensory mechanism? J Physiol 505:503–511. (2011) ATP and P2X purinoceptors in urinary tract disorders. Handbook Exp Pharmacol 202:485–526. (2009) A1 and A2a receptors mediate inhibitory effects of adenosine on the motor activity of human colon. Neurogastroenterol Motil 21:451–466. (2010) Adenosine receptors as drug targets. Exp Cell Res 316:1284–1288. (2011) International Union of Basic and Clinical Pharmacology. LXXXI. Nomenclature and classification of adenosine receptors--an update. Pharmacol Rev 63:1–34. (1988) Evidence for adenosine triphosphate as an excitatory transmitter in guinea-pig, rabbit and pig urinary bladder. J Physiol 404:39–52. (2002) 2-Chloro-N(6)-cyclopentyladenosine, adenosine A(1) receptor agonist, antagonizes the adenosine A(3) receptor. Eur J Pharmacol 443:39–42. (2013) The surmountable effect of FSCPX, an irreversible A(1) adenosine receptor antagonist, on the negative inotropic action of A(1) adenosine receptor full agonists in isolated guinea pig left atria. Arch Pharm Res 36:293–305. (1972) The effect of adenosine on the release of the transmitter from the phrenic nerve of the rat. J Physiol 224:629–645. (1992) Primer of Biostatistics, McGraw Hill Inc., New York. (1985) Atropine-resistant excitatory junction potentials in rabbit bladder are blocked by alpha,beta-methylene ATP. Eur J Pharmacol 114:239–240. (2004) Role of P1-receptors in the contractile function of guinea-pig and human detrusor smooth muscle [Abstract]. J Physiol 551P:C9. (2012) Botulinum neurotoxin serotype A suppresses neurotransmitter release from afferent as well as efferent nerves in the urinary bladder. Eur Urol 62:1157–1164. (2011) Worldwide prevalence estimates of lower urinary tract symptoms, overactive bladder, urinary incontinence and bladder outlet obstruction. BJU Int 108:1132–1138. (1997) A medium-term analysis of the subjective efficacy of treatment for women with detrusor instability and low bladder compliance. Br J Obstet Gynaecol 104:988–993. (2013) The guinea pig atrial A1 adenosine receptor reserve for the direct negative inotropic effect of adenosine. Gen Physiol Biophys 32:325–335. (2014) Roles of adenosine A1 and A2A receptors in the control of micturition in rats. Neurourol Urodyn 33:1259–1265. (2010) Adverse events of intravesical botulinum toxin a injections for idiopathic detrusor overactivity: risk factors and influence on treatment outcome. Eur Urol 58:919–926. (2010) Excitatory cholinergic and purinergic signaling in bladder are equally susceptible to botulinum neurotoxin a consistent with co-release of transmitters from efferent fibers. J Pharmacol Exp Ther 334:1080–1086. (1998) Validation of Furchgott’s method to determine agonist-dependent A1-adenosine receptor reserve in guinea-pig atrium. Br J Pharmacol 123:1425–1433. (2010) Removal of urothelium affects bladder contractility and release of ATP but not release of NO in rat urinary bladder. BMC Urol 10:10. (1992) Presynaptic A1-purinoceptor-mediated inhibitory effects of adenosine and its stable analogues on the mouse hemidiaphragm preparation. Naunyn Schmiedebergs Arch Pharmacol 346:197–202. (2011) Guide for the Care and Use of Laboratory Animals, 8th ed, Institute of Laboratory Animal Resources, Commission on Life Sciences, National Research Council, Washington, DC. (2012) Modulation of bladder function by luminal adenosine turnover and A1 receptor activation. Am J Physiol Renal Physiol 303:F279–F292. (1993) A selective adenosine antagonist (8-cyclopentyl-1,3-dipropylxanthine) eliminates both neuromuscular depression and the action of exogenous adenosine by an effect on A1 receptors. Mol Pharmacol 44:835–840. (2012a) Modulation of purinergic neuromuscular transmission by phorbol dibutyrate is independent of protein kinase C in murine urinary bladder. J Pharmacol Exp Ther 342:312–317. (2012b) Evidence for constitutively-active adenosine receptors at mammalian motor nerve endings. Eur J Pharmacol 685:38–41. (2004) Adenosine decreases both presynaptic calcium currents and neurotransmitter release at the mouse neuromuscular junction. J Physiol 558:389–401. (1996) A novel irreversible antagonist of the A1-adenosine receptor. Mol Pharmacol 50:196–205. (2004) Geriatric urologic disorders, in Applied Therapeutics: The Clinical Use of Drugs (Koda-Kimble MA ed) 8th ed, pp 101–124, Lippincott Williams & Wilkins, Philadelphia. (2001) P2X3 knock-out mice reveal a major sensory role for urothelially released ATP. J Neurosci 21:5670–5677. (2015) Age-related decrease of adenosine-mediated relaxation in rat detrusor is a result of A2B receptor downregulation. Int J Urol 22:322–329. (2014) Phase III, randomised, double-blind, placebo-controlled study of the β3-adrenoceptor agonist mirabegron, 50 mg once daily, in Japanese patients with overactive bladder. BJU Int 113:951–960.